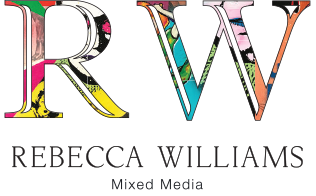 About Rebecca Williams Original Art & Pop Artist Washington D.C.
Rebecca Williams has been a Creative Director for over 10 years, working and living in Washington, DC. She has helped business leaders find their voice and express strategy through visualization — and now she turns inward to express her own. A perfectionist who pushes herself to disrupt order, Rebecca reaches back to nostalgic imagery where perfection lives in the mind’s eye.  Strength, femininity, brilliant colors, and pop culture references combine to pull at heartstrings and grab attention. Pulling from her innate curiosity of information design, technology, and culture change, Rebecca mines for narratives to bring to life through screen printing, collage, and color application. The pieces are either one-of-a-kind or in limited editions, on either wood or direct installation application. Rebecca also does commissioned work. 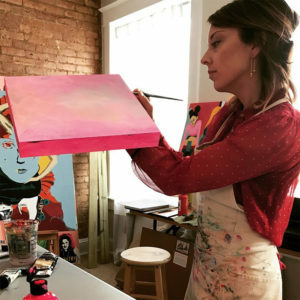 Enabled by her strong work ethic, Rebecca’s art is precise, yet gritty, feminine, yet bold. Her pieces are conceptually and visually interesting because of their multi-dimensional storytelling and contradiction. Rebecca is tackling her artist career in earnest with unwavering support from her brilliant husband and house full of boys and dogs.